Ever since the crypto winter has started, the cryptocurrency market has gained a lot of negative impression from the mainstream community. It cannot be denied that money has been lost due to the drop of prices, and some have lost faith and given up entirely. Interestingly, despite this, the crypto-economy still remains one of the most lucrative industries to date. But how does it still remain the Goliath that it is? This is because even amid the current crypto-climate conditions, countless ICOs with innovative ideas are emerging left and right to persuade investors into fulfilling their game-changing vision, giving investors an opportunity to profit while at the same time, allowing them to realize their technological endeavors, crypto winter or not. Faireum boldly presents itself amid the bearish climate with a sole mission: to provide the people with the best that the blockchain technology has to offer, backed by a self-sustaining economy. BREAKING THE STIGMA is the main challenge that Faireum faces in imparting its core values into the crypto world. 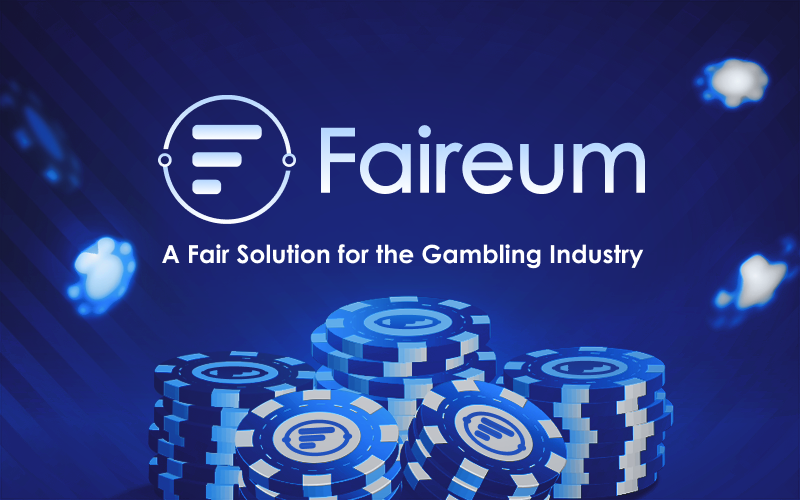 Faireum wants to create an investor-friendly environment by creating a stable economy by means of providing completely safe, transparent, and fair gambling platforms that eradicate all the destructive impacts of traditional gambling to the players, safeguarding both their trust and well-being, as well as the economic standing of the Faireum ecosystem, unaffected the crypto winter. “Why online gambling?” This perhaps is the most pressing question among interested investors and the answer boils down to one factor: token relevance. Growing at a compound annual growth rate (CAGR) of 4% in 2017 and increasing, the global gambling industry is expected to grow from $533 billion to $1 trillion by 2021. This means that the applications of the Faireum coin and blockchain alongside its protocols will remain relevant, even outside the main crypto market, because of its applications in the gambling industry. This assurance of a trading volume safeguards the coin price from over-volatility and unpredictability, which are the most common problems that most ICOs suffer in the market. The team behind Faireum has developed an entirely new and competitive independent blockchain based on the strengths of Bitcoin, Ethereum and Hyperledger. Alongside this is Faireum’s consensus algorithm which is adopted from the Byzantine fault tolerance-based delegated proof-of-stake (BFT-DPos). An attack on the consensus is virtually impractical and impossible, as proven by Faireum’s role models. Furthermore, the Faireum Virtual Machine (FVM) allows users and investors alike to create smart contracts that are interconnected with a wide array of blockchain-based coins, as well as freely exchange assets at any time, in any place. Obviously, random number generators (RNGs) are essential for games of chance. However, the problem is that there are no standard methods of creating an RNG that is closest to being truly random. This results in a flawed game logic that centralized online betting platforms implement. No one knows how these programs work and people are losing money without them knowing. The Zero Random Algorithm is Faireum’s answer to these questionable RNGs being implemented in gambling platforms. By having a blockchain-based internal RNG that is validated by Zero-Knowledge proof, each random number generated from the blockchain is verified to be truly random, or provably fair. There are no secrets between Faireum and its valued users. Outside Faireum’s very own official platform, everyone else can get their hands on Faireum’s innovation. With Faireum’s application program interface (API) and software development kit (SDK), game developers and platform proprietors can also easily adapt and integrate Faireum into their games and systems and tailor them according to their preference. Faireum sees a service-based value-for-value blockchain ecosystem. This eliminates the chance-altering systems of gambling platforms that exist solely for profit. In this way, players get what players give. A fair chance for everyone. With Institutional Investors such as University endowments like Harvard and MIT now investing in cryptocurrency funds, a more transformed business model awaits the crypto-economy wherein various economies of countless fields merge into one stronghold that is insusceptible to mere crypto climate conditions alone. Faireum brings this transformation to the investors—a soil to plant their seeds on—to show them that their seeds aren’t dead, after all. Transforming investing, gambling and beyond—this is the vision of a Faireum-powered future made possible. Share with us a Faireum-powered world. Join us on Telegram, Facebook, Twitter and Medium for more news and updates.